Brent Omar Grimes, born on 19th July 1983 in Philadelphia, Pennsylvania USA, is an American Football cornerback, who currently plays for the Tampa Bay Buccaneers, while he previously played for the Atlanta Falcons and Miami Dolphins of the National Football League(NFL). His career started in 2006. Have you ever wondered how rich Bren Grimes is, as of late 2016? According to authoritative sources, it has been estimated that Brent`s net worth is as high as $8 million, earned through his successful career in the NFL. Brent grew up in his hometown, the son of Deborah Hall, however, the identity of his father is unknown to the public. Before his professional career started, he attended Shippensburg University where he played football and was selected three times as DII All-American, and after graduation he declared for the 2006 NFL draft. However, he ended up being undrafted, but still found engagement with the Atlanta Falcons, although e didn`t play for the team until 2007, spending a season at Hamburg Seas Devils of NFL Europa, and with this team Brent won the World Bowl (XV) in 2007, in a match in which his team defeated Frankfurt Galaxy. The next year he was summoned by the Falcons and played for them until 2012. 2009 season was his breakout year; he recorded 66 tackles and six interceptions. The following season he continued in the same manner, with 87 tackles and five interceptions, earning a spot in the Pro-Bowl. His numbers were lower in 2011, then unfortunately in 2012 he suffered an Achilles tear in the first match of the season, and was unavailable until the next year. 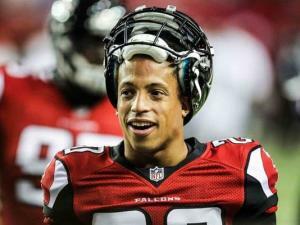 Falcons decided not to sign another contract with Brent because of his injury, and he became a free agent. That didn`t last long as he signed a contract worth $5.5 million over one year with the Miami Dolphins, and posted some extravagant numbers for a player returning from an Achilles injury; he had 60 tackles and four interceptions. This earned him a new, better contract with the Dolphins, worth $32 million over four years in 2014, however in 2015 he was released by the Dolphins because he didn`t want to restructure his contract, despite excellent games. He wasn`t long without a club, however, as he signed a contract worth $16.5 million over two years with the neighbouring Tampa Bay Buccaneers, which certainly increased further his net worth. Thanks to his great performance from the 2010 season on, he has been selected four times for the Pro-Bowl game, in 2010 and consecutively from 2013 until 2015, also he was named into PFF First-team All-Pro in 2012 and Second-team All-Pro in 2014. Regarding his personal life, Brent has been married to sports talk show host Miko since 2010; the couple has a son together.